Donald Friedlich has developed an international reputation for his elegant, innovative jewelry in glass and gold. His current repertoire of brooches includes curving, leaf-like shapes, subtle rounds that suggest rippling water, and a delightful series cast directly from items in the produce department, like celery stalks, apple slices, asparagus stalks, and sections of squash. Friedlich has always been interested in creating jewelry from non-traditional materials: his early work was made in slate, optical glass, semi-precious stones, and even ceramic tile. 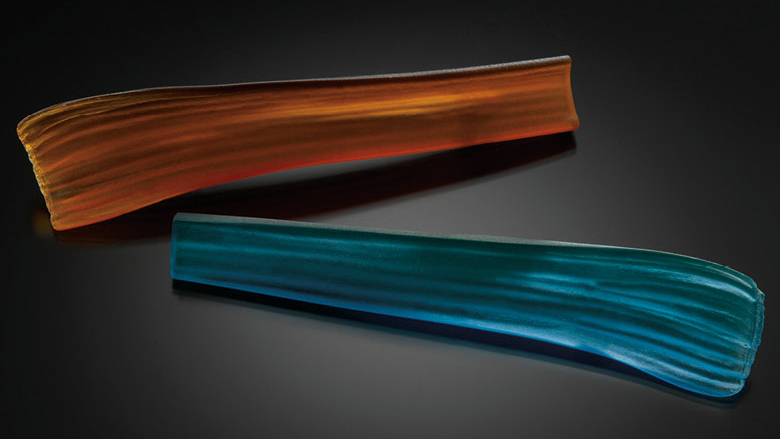 Since the mid-1990s he has concentrated on glass, which he works in two ways: "cold" (using lapidary techniques like a traditional gemcutter, as well as etching and sandblasting), and "hot" (casting hot glass or fusing powdered glass in heat-resistant molds). This exhibition features selections from four series of Friedlich's work. The Aqua series is inspired by wave patterns in water and raked sand in the Zen gardens of Japan; the Flower Petal series, cut from sections of blown glass, are geometric abstractions that resemble flower forms. Friedlich describes his Magnification series as "site-adaptive" jewelry: brooches shaped to develop spherical optics that either magnify the weave of the textiles on which they are worn, or create the illusion of glowing from within. His most recent Organic series transforms everyday fruits and vegetables into sensual, brilliantly colored marvels with a sweet sense of humor. As Friedlich says, "The idea of wearing a stalk of celery as a brooch makes me smile." Dianne Soffa's abstract color field paintings in encaustic, oil, and acrylic have thick, luscious surfaces, luminous color, and an emotional core. Ranging in size from tiny, four by four inch pieces daubed with wax-based encaustic to six foot square canvases painted with bold, sweeping strokes, all of the works share the artist's dedication to color, beauty, balance, physicality, and the power of memory. 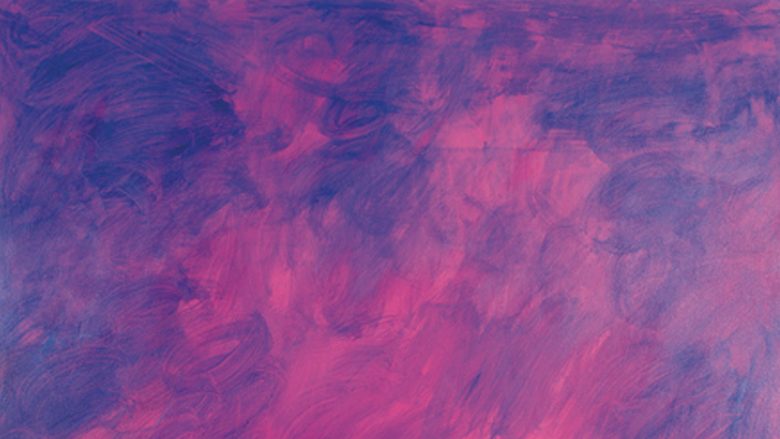 Many of Soffa's paintings represent her interest in using color as a trigger for memories that cross the boundaries of the senses, interweaving visual impressions with taste, smell, touch, and sound. For Soffa, dense purple captures the humid, crackling atmosphere of a summer storm's approach, while certain shades of green evoke the hum of mosquitoes in an overgrown backyard. In some cases, specific personal memories of childhood summers in small town Wisconsin have inspired the work. A large, hot red canvas titled Aphrodite Meets Ferrari, for example, connotes speed, luxury, and the racy Jaguar that her father drove only in summertime (it was terrible in the snow, as Soffa recalls). Without describing the car directly, Soffa's abstract canvas brilliantly captures the heat and excitement of zooming down a country road on a sultry day. Images: (left) Dianne Soffa, Fog Candy, 2013. Acrylic on canvas, 72 x 72 in. (right) Donald Friedlich, Celery Brooches, 2013. Glass, 14k gold, (top) 6 x 1.25 x 1.75 in., (bottom) 6 x 1.25 x .75 in. Photo: Larry Sanders. Donald Friedlich lives and works in Madison, Wisconsin. Dianne M. Soffa has a B.F.A. from the University of Texas and an M.F.A. in painting from the University of Wisconsin. She has shown both nationally and internationally, with a recent one-person exhibition at the Macay Museum of Contemporary Art in Merida, Mexico.